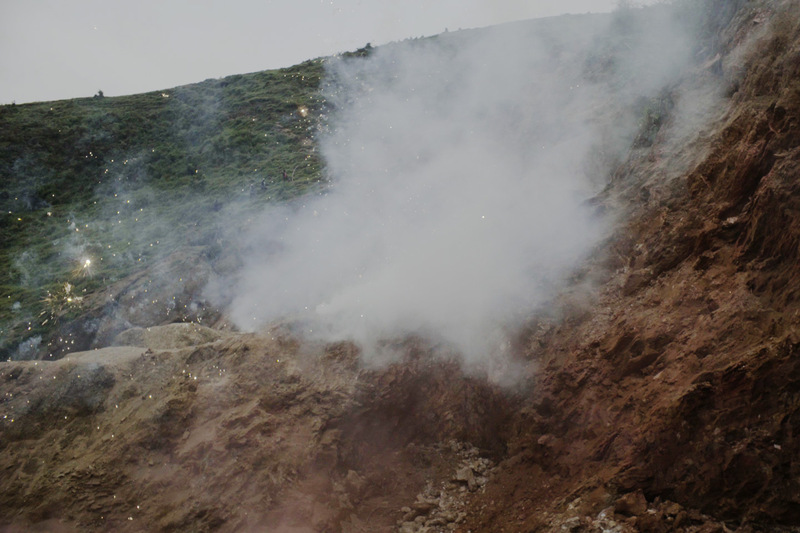 In the film Trapped in the Dream of the Other a camera navigates through what the artists themselves have called a performance: in the summer of 2016, bespoke fireworks were set off in an open-air mine near Numbi in the Eastern region of the Democratic Republic of the Congo. The fireworks had been imported from Liuyang in Hunan Province, the epicentre of the People’s Republic of China’s fireworks industry, by means of a twenty-first-century Iliad that at this moment in time had already continued for a number of years and required several circumnavigations of the globe as well as its bureaucracies. Revital Cohen and Tuur Van Balen had commissioned the manufacturer Dominator Fireworks in Liuyang to produce 100 kg of custom-built pyrotechnics. Exporting these back to the Democratic Republic of the Congo (DRC) required establishing an entirely new trade route (there are currently no firework importers in or near the DRC): the boxes arrived in Numbi by way of a container ship to Durban in South Africa, a protracted flight to Kigali in Rwanda via Addis Ababa in Ethiopia, a drive to the border of the DRC, an arrest, a bribe, and a convenient retitling of the goods as “special effects.” Shipping ammunition might have been easier. One half of the artist duo is positioned remotely, and the other at the scene. One holds a recast resin Sega controller gun (A 9 10 S 11 12 Red Sinkhole) to a screen in a studio in East London, and the other a steady cam trained at a mystery of proliferating smoke in the mine. Where exactly, though, is the scene and where is the set? At which location does the action take place and where the reaction? Where is the audience, and who, as the title suggests, is trapped in whose dream? A heavily pixelated video feed and a series of text messages containing a shorthand description of the positioning of the fireworks in the mine’s trenches are what arrive on the one side of this reality. On the other—a misty grey sky; green hills that extend to the horizon and look simultaneously abundant and empty, real and unreal; reddish-brown furrows dug into the face of the mountains; boots, heavy with grey mud, making their way through the maze (the mine), carried by the miners’ legs in mud-coloured clothes; distant music; distant sounds of goats; voices; distant recollections of the narratives and knowledges of a colonial past and neo-colonial present that inform the gaze as much as, or even more than the images in front of the viewer’s eyes. 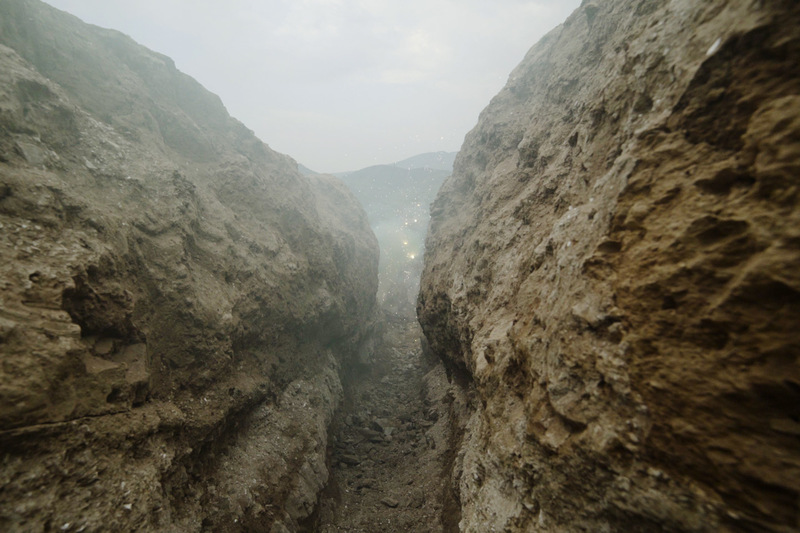 The camera pilots the viewer on unsteady footing through the rubble of the dugout ditches, into a makeshift hut, down the hill in pursuit of workers carrying sacks of quarried minerals, or towards close-ups of the shapes hewn into the rock by the so-called “artisanal” miners. The workers’ labour is visible in several shots and becomes viscerally comprehensible as arduous beyond words. The most basic tools are used to carve away at the mountain, a backbreaking chore in order to uncover, loosen, hack, crush and crumble the earth itself into components that are sifted and collected in heavy sacks, to be rudimentarily washed and refined and sold off to the comptoirs who are waiting to take the cache to larger cities nearby, where the raw minerals can be refined further before they are shipped to China to be processed by Foxconn and other factories. In both worlds: the amplified feedback sound of a smartphone internet connection, the crackling humming noise of technological connectivity, droning this new Iliad into the ether and into the world, transmitting incessantly between screens and controllers. 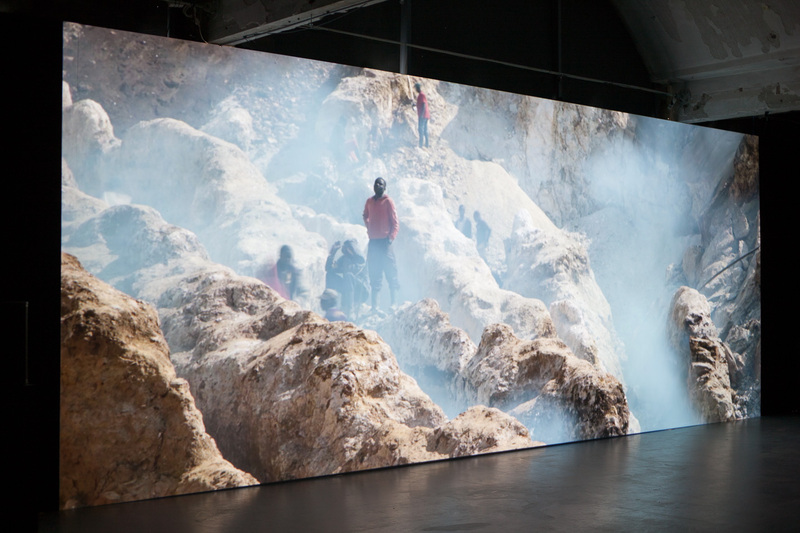 This implausible network is conducted by electronic devices that contain some of the rare earths, so-called conflict minerals, whose excavation is visible in the film. The Democratic Republic of the Congo is rich with resources of coltan, cassiterite, gold, tungsten, and other minerals and metals that have become essential components of smartphones, computers, PlayStations, and many other devices. Nearly all of us carry these embattled resources with us as a daily part of our connected lives, and this entrenched fortune is part of the reason why the DRC remains in constant violent upheaval. Men, women, and children work in the mines in inhumane conditions, and legislative attempts to solve this crisis, such as the due diligence measures instated by the Obama Administration as section 1502 of the Dodd-Frank Act in 2010 have failed to disentangle the situation. Efforts to install ethical conduct within supply chains for Apple, Intel, and others remain shambolic, while these companies’ revenue streams are unaffected. Setting up viable systems and procedures to audit mining sites in the remote areas of the DRC to trace the provenance of minerals is beyond impossible, leading international buyers to pull out of the region altogether. By calling for or relying on non-existent infrastructures, this new legislation paradoxically instead plays into the hands of armed militia, “conflict actors,” who recruit out-of-work miners or facilitate illegal smuggling and racketeering. NGOs run by “well-meaning” First-Worlders with limited knowledge of the local situation or, worse, with their own stakes in upholding the catastrophic status quo have caused local economies to plummet. Nothing about this state of affairs is simple or straightforward and there is no objective account from the inside. There is also no outside. 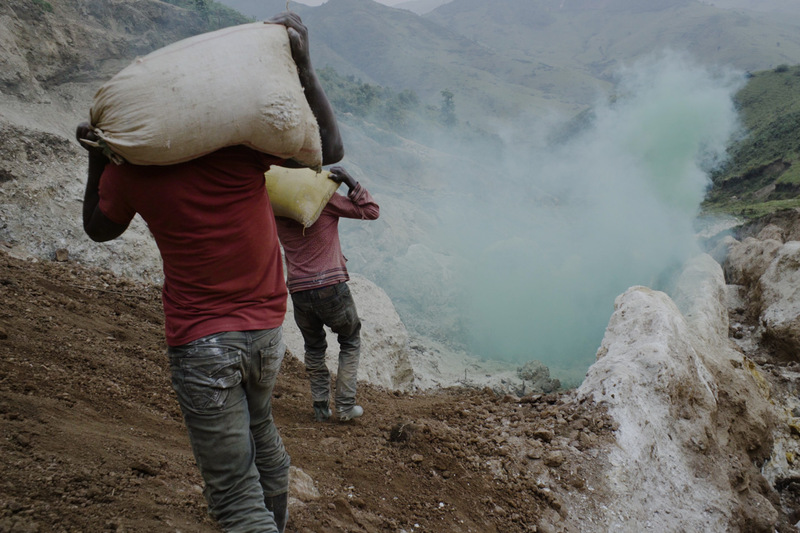 Word of the arrival of the documentary film team of Vice magazine travelled so fast that when it’s members reached the Eastern DRC, they were met with a performed and clean version of life and labour in the mines, to be fed to the coltan-powered screens and devices of their global audience. The camera moves through an active mine near Numbi whose workers, on that particular day, are extracting either coltan or cassiterite (the minerals can’t be distinguished in the mine itself). On other days, they will work in other mines—their daily labour and the material that they dig for is determined by the fluctuating prices of minerals and metals on the world market. The camera’s movements are clearly those of a human operator, walking, trudging and climbing, turning, searching for the pyrotechnics, trying to anticipate the Sega controller’s commands. 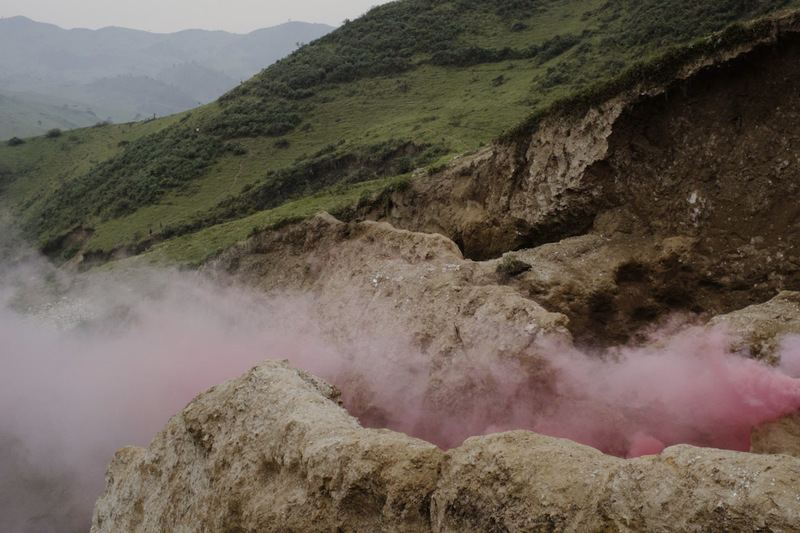 In the moments when the camera catches a nearby detonation, it is enveloped in white, green or pink smoke that creeps through and lingers in the trenches, ethereal yet gravity-bound and strangely soulful. The metallic airbursts sizzle after detonation, the shimmering gold dust disseminating back into the soil that it came from (much like in the earlier photographic work Retour). To make them fly in the right direction (up), nearly all fireworks contain a small amount of soil taken from the local area of manufacture. 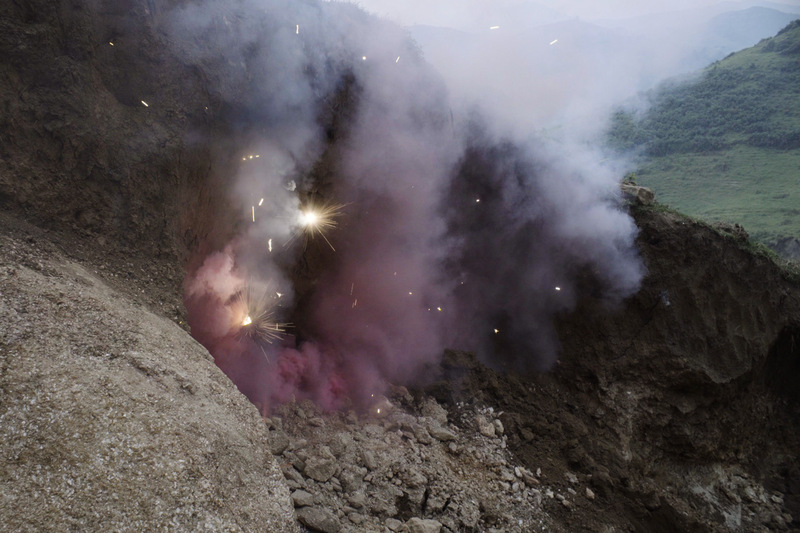 Trapped in the sparklers and released via remote control, tiny quantities of Chinese earth are thus disseminated in the Congolese mine, blending for a moment with the other ultimately China-bound minerals. Colossal and slightly manic activity surrounds Van Balen and Cohen’s work. The meticulous disassembly and reassembly of material (as in D/AlCuNdAu, where metals from hard drives taken from the DataCell data centre in Iceland were mined and reconfigured into mineral form) accompany an interest in the act of dismantling as a tool for disillusionment and reconfiguration. Their work perpetually negotiates minor and major distances, be it through global voyages—crossing the Indian Ocean to China on a container ship—or by traveling across time by appropriating Super 8 film shot by Van Balen’s Belgian grandfather during his time in Congo in the mid-twentieth century. Familiar colonial histories thus become literally familial and personal in the assembled material that composes the two-channel video Dissolution (I Know Nothing). It seems, however, as though at the heart of this continuous movement—mimicking those of the global intricacies of extraction, exchange, and expenditure—the artists’ interest in undoing matter, movement, or medium points to an ultimately motionless centre. The salvaged minerals and metals at the core of Van Balen’s and Cohen’s excavations and circulations remain unscathed and immutable throughout their itinerant co-option into a constantly revolving system. After all, this global system itself similarly relies on the fundamental continuity of its patterns of consumption. The frenetic movements and even the language of a Western techno-hegemonic world order, most clearly legible in the term “developing country,” ultimately describe a system that is designed in order not to change. But while Cohen and Van Balen uncover the core components of its mainframe, they also imply that these components can function beyond it. Something man-made can be undone, and something prehistoric can be engineered. Several printed gauze curtains are installed in the gallery space. The work, like the exhibition itself, is titled Avant tout, discipline (discipline before everything), a maxim that the artists encountered written in chalk on a wall of a secret service office in South Kivu. The curtains feature landscapes familiar from the film, rendered unreal and even more feverishly eerie than the moving images. To create them, footage from the film was processed by a program that simulates immersive environments for video games: the camera’s movements, already emulating the generic gamer perspective of a remote controlled body with a cyclopean eye, delivered the parallax information necessary to generate the rudimentary three-dimensional shapes of the rocks and stone. Avant tout, discipline could be the first sentence of an alternative book of Genesis, a violent creation myth of modernity: In the beginning, there was discipline. This Foucauldian notion of discipline as an a priori, as a point that accepts no before or beyond, describes not only how colonialism, imperialism, and capitalist extractionism have shaped the world as we know it, but also the way that movement and perception are subject to a discipline that is simultaneously embodied, symbiotic, and situated, whether in a Congolese mine, in front of a game console, in a firework factory or in an Apple store. 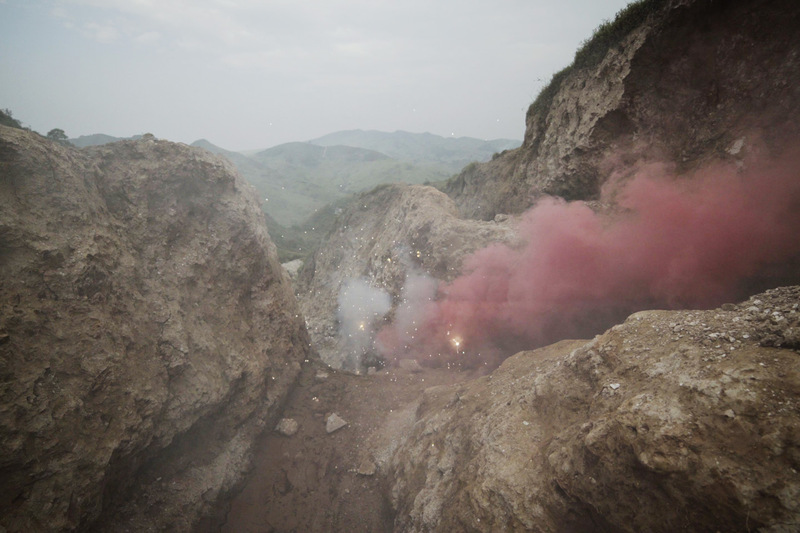 Cohen and Van Balen’s practice points to this correlation while it instigates drastic dislocations as a possible form of counteraction: staging a virtual dreamscape of smoke and sparklers and bringing the materials and agents of this scenario into remote and immediate contact.